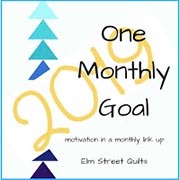 This entry was posted in Motivation, One Monthly Goal, Quilts and tagged Elm Street Quilts, LCsCottage, OMG, One Monthly Goal, patchwork, RSC18, scrappy, So Scrappy, Squared Away Sampler, The Academic Quilter. Bookmark the permalink. I love your sashings, it’s going to be a beautiful RSC quilt! Thank you, Frederique! You have a good eye, since it is so hard to tell from my black and white ‘design floor’ what the heck I am doing. Ha, ha! Beautiful! I love all the cheerful colors. I look forward to seeing it all pieced together. Thanks for the shout out! I’m glad you are part of OMG! Beautiful blocks – Thanks for linking up with Elm Street Quilts One Monthly Goal and good luck with your project. I like your star sashing! Adds so much to the quilt! Very pretty Lori! Congrats for staying on track! I am getting there – very slowly but getting there. Two trips coming up and I am looking forward to getting away! Thanks, Nanette! I wish I was a mouse in your pocket, so I could go on a trip, too! Have fun! Your squared away sampler blocks look great, can’t wait to see the finished flimsy. Love your design floor! I lay things out on the floor to see how they’ll look too.